It’s been a long time coming, but it happened. 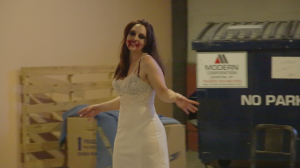 October 2nd, 2015, we filmed the first step in my Indie Film project Click Chamber. Day one was focused on one of the characters initially from the play, The Daughter. This is a character that has undergone more change than most in the universe and will change even more as everything goes forward. Given the parameters of the initial run of the show, I did not write the character, my previous writing partner did. I created the character, her story and through line, but did not write her monologue. The result was an interesting piece of writing, but with a completely different tone to my own more lyrical and spoken word based ideology. I was told that the foundation for The Daughter’s piece was the character I wrote, her father, The Boss, and that it was re-written and adapted. I was never quite sure how to take that. The Daughter is one of the dead characters in Click Chamber. She talks to us from just beyond the grave. Chronologically she has died just before her story, possibly even the night before. My envisioning of the character always has been and will be of simplicity and isolation. To that effect for the Buffalo production she was presented barefoot, in a basic, white, slip. The blood on her face and the smeared makeup contrast her somewhat innocent look. The carefree attitude Hilary exudes in the photo was shocking in her surroundings; a dumpster, another dead body, drugs spread everywhere and being less than 5 feet from the audience. For NYC and the F’Off festival, you can see her in a very different outfit. Her colors are darker, she’s wearing a flannel, and the tone was ‘Grunge’. I was completely against this choice, but because I had not written the words for the piece, and because Hilary also liked the idea I acquiesced to it. Looking back I wish I had been firmer in my thought process. The outfit is too presentational and gives off too much of a specific ‘mug’, and goes against the original concept of the character. What did work was more explicitness in her emotional turns, and we worked on her being more of a dominant personality even in the afterlife. It’s an interesting reverse on Charlie the Idiot (Bryan Patrick Stoyle) and his musings on death, because he sees dark, harboring, and venomous creatures ready to give him eternal torment, while The Daughter is not impressed. The nail file worked well as a symbol of empowerment, violence, and in a not so subtle way as reference to the character’s termination of her pregnancy. In a perfect 3rd run, she would look like Buffalo, and add the emotional peaks from NYC including the nail file. For the short, we wanted to establish an element of psychological horror, with inspiration from French New Wave as well as Takeshi Kitano with The Daughter character showing her descent into the gutter. Kitano has a way of letting the setting be organic and lets his actors play, eschewing the idea of back and forth that a lot of film is doing today. We shot on location at South Campus and Amherst Street subway stations (first image is of Hilary there). The image there is one of the few you’ll see of her directly in frame. We wanted to establish a significant element of isolation and self (and drug) induced paranoia, so we utilized the surroundings to make her more of a piece passing through. The setup is not about her. It’s about her situation and feelings and how environment can be a big factor in determining behavior. You won’t see her doing anything significant during her trip in the Buffalo underground, but you will get a sense of how she’s living her life. Inside, she’s at home (and again in flannel, though in the context of being in her own home it was a solid choice by our actress). We wanted to change the focus and the viewer’s range to her while she went through her highs and lows on the floor of the bathroom, and took multiple takes from different angles. After that, well you’ll just have to watch it to see. I can’t speak enough about Hilary and her dedication to our indie film project and what she did for me in this scene. I had been contemplating what to do if I had to influence her attitude, and how far I might go to push her to where she needed to be, but she did it all on her own, and in the end a supportive albeit sparsely offered environment boosted her confidence. It is some of her best work she has ever put forth and I couldn’t be prouder of it.